Convenience stores have long been a part of South Korea’s quick, fast-changing lifestyle, and they have now taken a step further by producing their own private brands. What makes their private brands work is the convenience store chains’ wide distribution capacities. Most convenience retail brands do not spend large sums of money on ads for their private brands, because promotion is taken care of simply by placing the products on store shelves nationwide. “The private brand business here will continue to grow across all industries, centered on firms with strong distribution channels. South Korea has a relatively low private brand penetration rate compared to other OECD (Organization for Economic Cooperation and Development) countries,” said Suh Yong-gu, a professor of marketing at Sookmyung Women’s University. For customers, an affordable price tag is one of the biggest advantages of private brands, Suh added. The launch of 7-Eleven Korea’s private coffee brand Seven Cafe, for instance, demonstrates one such case in which an affordable private brand product has become a serious threat to existing brands. According to the company, Seven Cafe ranked No. 1 in terms of the number of products sold at the chain’s shops between July 1 and Nov. 16. This marks the first time that a private brand product outperformed established branded goods sold at 7-Eleven outlets here. Seven Cafe started operations at just 20 vendors in January 2015, and had expanded to 4,200 vendors as of November. In addition to developing their private brands, convenience store retail brands are also collaborating with other well-known consumer goods manufacturers for added value. Manufacturers can gain an upper hand in marketing through diverse distribution channels, while the convenience store chains can benefit from their brand power. South Korea’s leading convenience store chain CU this year worked with dairy company Seoul Milk to release CU Big Yogurt. Since its launch last April, over 1 million bottles have been sold every month, CU said, adding that it topped the list of yogurt beverages sold at CU outlets. “I first found out about yogurts sold in big bottles in Taiwan through a travel blogger’s post. I had always wanted to try it out since then, so I ran to the closest CU shop when I heard about its release online,” said 29-year-old Lee Yoon-ha. The CU Big Yogurt comes in a 270-millileter bottle, about 4.5 times bigger than the original smaller size yogurt drink. According to CU, sales of its private brand products rose 36.9 percent on-year in the first half of this year. CU outlets have on display some 1,000 different private brand goods, making up about 20 percent to 25 percent of all products sold at the convenience store brand. 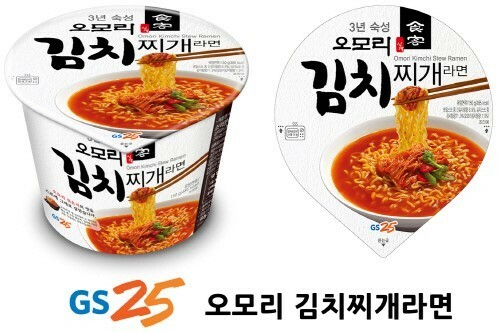 Local convenience store chain GS 25, run by GS Retail, and instant noodle maker Paldo jointly rolled out Omori Kimchi stew ramen. According to GS 25, some 9 million units of the Omori Kimchi stew ramen were sold within a year of its release, making a name for itself as a mega hit product and surpassing sales of Nongshim’s famed Shin Ramyun. To keep up with the change in demand, convenience store chains constantly experiment with new private brand products. In October last year, for example, leading local convenience store brand CU together with local toy maker Oxford Block introduced three limited edition toys. Marked at 26,000 won ($22), the toys were sold out within five days of release, due to high demand among adults, CU said. “The rise of private brand products suggests a rosy outlook for convenience retail brands. On the downside, it has cast a cloud over manufacturers of products such as beverages which have to allocate more budget for advertisements and promotions next year,” according to Kim Tae-hyun, an analyst at IBK Securities. Industry experts have pointed to the future of convenience stores’ private brand products by looking to Japan. “Over the past 10 years, Japan has seen a power shift from manufacturing companies to convenience retail businesses on the back of the latter’s distribution channels. For example, Seven & I Holdings, the operator of 7-Eleven Japan, gains 50 percent of its net sales from private brand products,” Han Kook-hee, an analyst at NH Investment and Securities, said in a report published in November. “Most leading Japanese manufacturing firms are keen to produce private brand products for convenience store brands,” Han added.